Looking to make a violin purchase? We are here to help. Choosing the right violin, especially as a beginner can pose many challenges because there are so many choices to make. We looked at Stentor violins and came up with the 5 best Stentor violin reviews to help you get your footing on which choices are best and to have a place to start from. In other word’s we did the work for you. The biggest problem when you are searching for a violin is narrowing down the list. There are so many luthiers worldwide that offer great options that it can be very difficult to narrow down the list and come up with a short list of options. 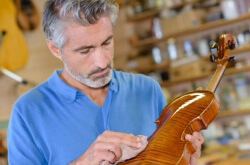 Even when you have the guidance of a professional it can still be hard to make the choice because ultimately you have to play the violin and you have to be happy with the violin. Instructors are typically not mindful of your budget the way you have to be. Often times if it was up to the teachers you would be running to auction to buy a Stradivari. We can help! We understand that all of it is important. You need a reliable, quality instrument that you can easily afford. There is no reason to go overboard on the budget when there are so many nicely priced options available. 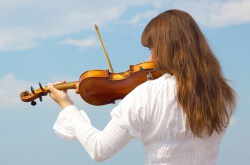 Your teacher means well but they may not understand that investing a lot of money at the on start of your violin lessons may not be something that you can or want to do. We understand! We reviewed many different models of Stentor to come up with the 5 best so that you can start right from the beginning with a short list in hand and decide from there which violin is best for your needs and your budget. Stentor brings over 100 years of music history to the table so they are considered a very trusted source when it comes to purchasing a violin from them. The company was started in the late 1800’s and registered as a company for gut violin strings and rosin. The company was started by a music instructor that set out to build better options for the violin. Initially Stentor was the brand name of the gut strings and rosin and the company name was the Harmonic Publishing Company. The company would import violins and other stringed instruments and brand them as Stentor. It was the early 1960’s when Stentor Music Company evolved and became a recognized luthier and since then many students have started their musical journey with a Stentor planted firmly at their chin. In the 1960’s Stentor began crafting their own violins instead of importing them and quickly cornered the market on student violins. When you make quality instruments like Stentor does it is not surprising when a company takes the lead and becomes one of the best known companies in the world. This company has grown to be a well-known international company that sells more orchestral stringed instruments than any other in the world. Many of the early Stentor musicians have gone on to teach and play professionally. Of course no one is promising if you buy any one of these Stentor’s that you will go on to be a performer but you certainly will be upping the odds that it could happen! This UK company offers some of the best student violins available and they have managed to keep things affordable so that everyone has the option of owning and playing a great quality violin. What Makes a Violin Great? 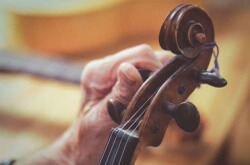 When you hear a piece played by the violin, even if the player hits every single note right, it sometimes sounds like it is lacking something, that is the violins fault. A violin is called a fine instrument for a reason. There are only a few working parts but they are so co-dependent upon each other to work perfectly in harmony. A good violin will play fine, it will stay tuned, it will look good and even have a measure of durability. A GREAT violin plays exactly the way a violin should play, yes it stays in tune but the curvature of the fingerboard is just right, the wood is aged to perfection and the sound is haunting. The craftsmanship of the violin makes it great. Luckily Stentor has managed to perfect the art of craftsmanship while maintaining fair and very reasonable pricing. Good news for you! You do not have to pay a fortune to have a great student violin! We have found you 5 great option that will meet a full range of needs. 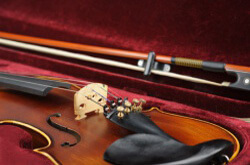 Here are the 5 best Stentor violins and the reviews of what they can offer you! 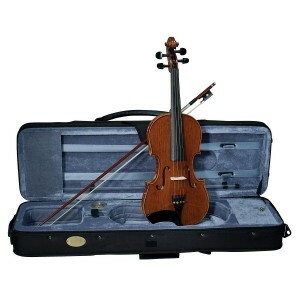 Stentor 1500 ½ sized Violin – this is an excellent entry level violin. It offers a fully hand carved spruce top and a solid maple back with maple sides. It offers solid ebony fittings. It has an alloy tailpiece with 4 string adjusters. It is outfitted with Red Label strings which are very sensitive and durable. The outfit comes complete with a horse hair bow and a canvas covered lightweight case. This is an excellent option for young children. The size is ideal and it comes highly recommended by users and teachers. The price is nice as well! 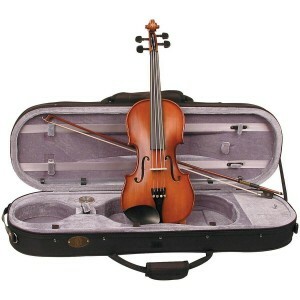 Stentor 1500 4/4 size Violin – this is the full sized version of the one reviewed above. It offers the same great craftsmanship. It has the spruce top, inlaid purfling, maple back and sides. It also offers a horse hair bow and the Red Label strings. 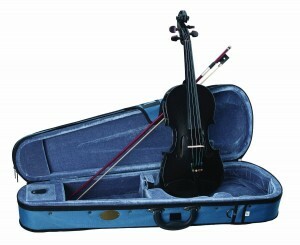 The outfit includes a case that is fully lined and comes with a blanket to cover the violin. Most people that have used this violin have given it 5 stars and have mentioned that it offers clear tones and bright notes. It is a nice affordable option and can be used by both beginners and intermediate users. Stentor 1542 4/4 Violin – This is a great violin that is also well-made and reliable. It has a great look and a great sound. Like all of the Stentor violins this violin is made from a solid spruce top and a solid maple bottom. 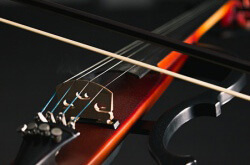 It offers an ebony fingerboard, a nice bow with ebony frog and ebony fittings. It is fitted with synthetic gut string. The outfit comes complete with a nice case that is fully lined and has space for your bow. It has a really nice shaded finish that is satin. This violin has all the offerings of a very expensive option but it is very affordable given the quality of the instrument and the craftsmanship. Stentor 1550 4/4 Violin – This full sized violin is crafted from solid tone woods. It has a deeply grained spruce top and a solid maple bottom with solid maple sides. The back of the violin is nicely flamed as is the sides. This is a little more expensive than the other Stentor’s that made it to the best list but it is well worth the extra investment for the intermediate or even the beginner that has the extra money to spend. 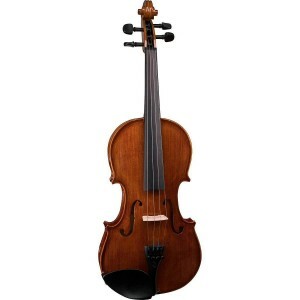 It is a really nice looking violin that has the ideal sound. Stentor has really done a nice job with this violin. The attention to detail is tremendous and it shows. This violin is a great choice. Stentor 1401BK-4/4 Harlequin Series Black Violin Outfit – this is a full size violin that has a unique style. It has a rosewood fingerboard and comes in several different colors. The outfit comes with a high quality case that is fully lined and lightweight. The case has an exterior pocket to hold a cell phone or another accessory. The inside of the case has a space for music and a bow. The outfit also includes a horse hair bow that matches the violin. This student violin will bring a lot of joy to any student and it is a fun look so it is great for early learners to help keep them interested. You cannot go wrong with a Stentor violin and these 5 best violins are a great place to get started with your search. We tried to look at all of the Stentor’s that are out there to determine which 5 deserved to be listed as best and reviewed. We considered pricing because we wanted to ensure budget friendly options. Budget is always important and we wanted to give everyone an opportunity to find a violin that they could feel confident purchasing and that they could afford. Stentor produces a great range of violins and all of them are reliable instruments that will greatly enhance your results but the 5 that are listed here and reviewed are the cream of the crop in their category. They offer the best that Stentor has to offer and can easily fit a full range of needs. We hope the reviews help you to narrow down your options to a short list.